On the weekend I popped out to see if I could track down the magazine that Emma from freedom creative had featured in a blog post. 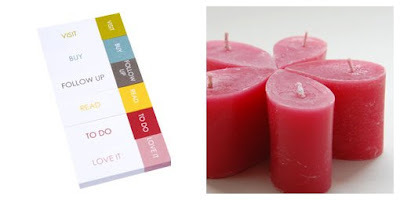 As a side note she has featured one of my candles in a recent post on her fave felt items. Thanks Emma! I got sidetracked checking out the new shops at Westfield, and was browsing in gorgeous organising mecca kikki-k when I saw these inspired little notes. Just perfect for when you're flicking through a mag, such as frankie, and you see something you just love... or want to buy... or that triggers an idea for a new creation. Indispensable for any creative person! Thanks Rose. Those post-its are cool!!! Kikki-k is so expensive, I wish I could afford to buy their wonderful stationery and things everytime I wanted! Did you find a Frankie? I must go and see if the new one is out yet. It is quite expensive, but I'm really liking the storage boxes, I want to buy some! I found frankie at borders, and it was the old one, so once I've read it I can go and buy another one! It has inspired me to have a go at illustrating.